North Coast Journal graphic If the 16 possible last-digit pairs of consecutive prime numbers were distributed randomly, each would occur about 6.3 percent of the time. But same-digit pairs (yellow boxes) appear far less often than chance would predict. This is the story of how a curious coin-tossing paradox led a pair of Stanford University mathematicians to find an unexpected property of prime numbers, a quirk in full view that had gone unnoticed. First, the paradox: Alice tosses a coin until she sees a head followed by a tail (H-T); Bob tosses until he sees two heads (H-H). Who gets the desired result first? Oddly (despite H-T and H-H having the same probability), on average Alice will get her H-T combo in four tosses, while it will take Bob six to get H-H. Why? Because if Alice fails — if she gets a head followed by a head — she has an even chance of getting her H-T combo the next toss. But if Bob fails, getting a head followed by a tail, he's at least two tosses away from getting his H-H combo. When Stanford University mathematician and prime-number maven Kannan Soundararajan heard this tidbit at a lecture, he wondered if something similar might happen with the last digits of two consecutive primes: Would some combinations be favored more than others? (Prime numbers can only be divided by themselves and one; they're the building blocks of mathematics, equivalent to elements in the real world.) Any prime greater than 5 can only end in 1, 3, 7 or 9, since a number ending in an even number is divisible by 2, and numbers ending in 0 or 5 are divisible by 5. So the only possible combos for the last digits of two consecutive primes are the 16 pairs 1-1, 1-3, 1-7 all the way up to 9-3, 9-7, 9-9. Since primes are considered "pseudo-random," you might think that each pair has an equal chance of appearing 1/16, about 6.3 percent, of the time. Wrong. When Soundararajan and his colleague Lemke Oliver checked the first billion pairs of primes, they discovered huge anomalies. 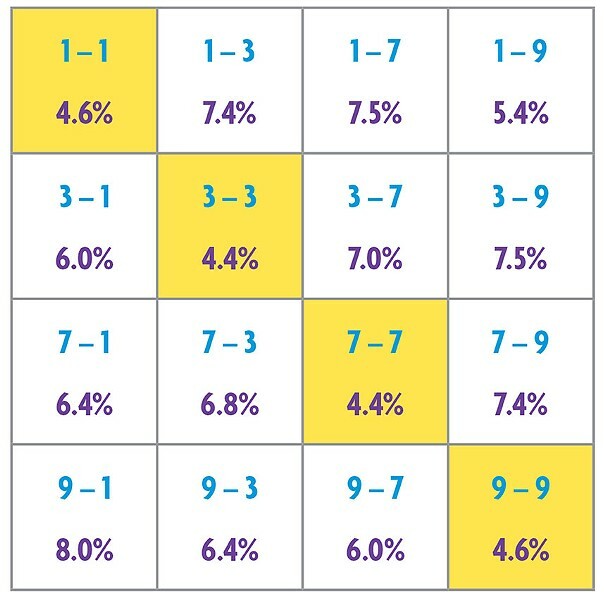 Turns out 1 is followed by another 1 (1-1) just 4.6 percent of the time; for 1-3 and 1-7, it's 7.4-7.5 percent, while 1-9 occurs about 5.4 percent of the time. The percentages are similar for the other 12 possible combos. Same-digit pairs 1-1, 3-3, 7-7 and 9-9 are particularly shunned — see the yellow diagonal line of boxes in the accompanying diagram. Who knew? No one, apparently. The title of Soundararajan and Oliver's paper (submitted to the acXiv preprint server March 11) says it all: "Unexpected biases in the distribution of consecutive primes." "Unexpected" is putting it mildly. Ever since Euclid proved 2,300 years ago that there's an infinite number of them, prime numbers have been the subject of intense scrutiny by the best and the brightest — without anyone stumbling upon this blow to randomness. A quick internet search shows the finding has sent number theorists scrambling. Soundararajan and Oliver suspect a link to an unproven hypothesis, the 1923 "Hardy–Littlewood k-tuple conjecture," which is way beyond my pay scale. For now, this odd property of primes is essentially a mystery, or as Lemke Oliver told Nature, "What we know is embarrassingly little." Which, in an age that pretends at wisdom, is somehow comforting. Turns out we're still ignorant of some of the most basic facts of nature enshrined in our 1, 2, 3 number system. Barry Evans (barryevans9@yahoo.com) is convinced he can understand the Riemann hypothesis if he just buys enough books on the subject.